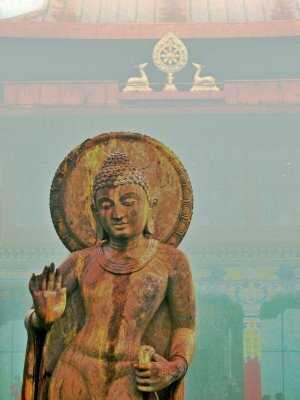 Abhaya mudra (Skt. abhayamudrā; Tib. སྐྱབས་སྦྱིན་གྱི་ཕྱག་རྒྱ་, kyab jin gyi chakgya, Wyl. skyabs sbyin gyi phyag rgya) — a mudra performed with the right hand held up at shoulder height, palm facing out; it symbolizes protection, peace, and the dispelling of fear. This page was last edited on 12 January 2018, at 20:13.